Day Conference, ‘The Welsh Medieval Church in its Context’, National History Museum, St Fagans, 15 November 2008. John Morgan-Guy, ‘Imaging the Bible. An Introduction to the Biblical Artwork of Wales 1840-1870’. Colloquium on English and Welsh Illustrative Practice, Cardiff University, 6 November 2008. John Morgan-Guy, ‘Medieval Welsh Churches and their Imagery. Wales and the Wider World’. Ecclesiological Society Annual Conference, St Alban’s Centre, London, 4 October 2008. John Morgan-Guy, ‘The Visit of the Eastern Patriarchs to St Davids Cathedral in 1925’. Conference of the Centre for Orthodox Studies & the Centre for the Study of Religion in Celtic Societies, “From the East to the Isles. Contacts between Celtic, English and Orthodox Christianity”. University of Wales, Lampeter, 23-26 June, 2008. Martin Crampin, Lecture series on the stained glass in three churches around Fishguard: the Church of St Peter, Little Newcastle, the Church of the Holy Name, Fishguard and the Church of St Mary, Fishguard. Presented by Artswave Wales, 21 June 2008. 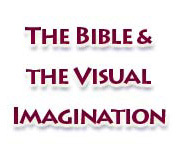 John Morgan-Guy and Martin Crampin, ‘Imaging the Bible. An Introduction to the Biblical Artwork of Wales’. Department of Theology & Religious Studies Summer School, University of Wales, Lampeter, 9–12 June 2008. John Morgan-Guy, ‘The Search for the Ideal Male. The Art of Hugh Easton’. Residential Meeting for the M.A. Body Programme, University of Wales, Lampeter, 26-29 May 2008. John Morgan-Guy, ‘The Via Crucis. 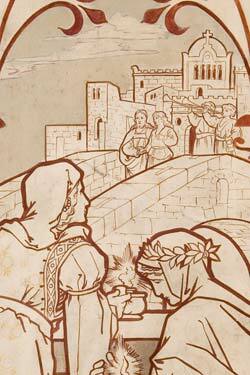 The Sign of the Cross in the Biblical Artwork of Wales’. Post-doctoral Research Symposium, University of Wales, Lampeter, 7 April 2008. Cambrian Archaeological Association Annual Conference, Llety Parc Hotel, Aberystwyth, 29 March 2008. John Morgan-Guy and Martin Crampin, ‘Imaging the Bible: Churches in Haverfordwest’. Pembrokeshire Historical Society, Haverfordwest Library, 5 October 2007. Martin Crampin, 'Imaging the Bible: Churches in Fishguard'. Fishguard Local Historical Society, Ysgol Bro Gwaun, Fishguard, 21 November 2007. Martin O'Kane, John Morgan-Guy and Martin Crampin, Imaging the Bible in Wales. Department of Theology Colloquium, University of Wales Bangor, 8 May 2007.